Opposition leader tells PM just as Arab world needs another Anwar Sadat, Israel needs another Menachem Begin to make peace. 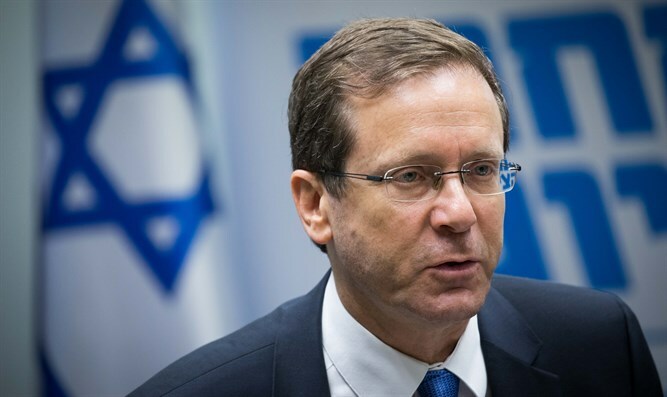 Opposition Leader Yitzhak Herzog (Zionist Union) slammed Prime Minister Binyamin Netanyahu during a special Knesset session in commemoration of the 40th anniversary of former Egyptian President Anwar Sadat's historic visit to Israel. In his speech, Herzog called on Netanyahu to promote a diplomatic process with the Palestinian Authority. "Overcome your anxieties, ignore your fears and try to change history. The people want peace, and we will act as the opposition faction did when it supported the peace treaty with Egypt." He addressed the criticism that the peace treaty with Egypt is 'cold' and did not lead to the normalization of relations with Egypt. "It is true that our relations with Egypt have had their ups and downs over the years, but this peace agreement is a strategic element in Israel's security concept and is quite 'hot' in quotation marks than many will admit in many diverse fields." Herzog said that a wider agreement with the Sunni Arab world could not occur without first making peace with the Palestinian Arabs. "The Palestinian issue will not disappear if you ignore it. Egyptian President Anwar Sadat said in a statement which has been echoing for the last 40 years: 'In all honesty I will tell you that peace can not be achieved without the Palestinians.' Today, there are young Arab leaders who are ready and willing to take responsibility for regional peace with the Palestinians. Today, the successor of President Sadat, Egyptian President Abdel-Fattah Al-Sisi, represented here with great respect by his Ambassador to Israel, is a brave and sober leader, who extends a hand to us and asks you - both openly in interviews and in closed meetings in my presence - '40 years after that historic step,are you ready to make peace? He spoke from the heart. He is brave,and he and his colleagues are ready for the next step." Al-Sisi has said that he will not seek another term. Herzog turned to Netanyahu, who had earlier said that he had never met a "Palestinian Sadat," and said: "You do not need a Palestinian Sadat alone. I already said two weeks ago here in the plenum - if you were standing in Menachem Begin's place I doubt if you would have discovered the same courage that Menachem Begin displayed then."